There are fundamental principles upon which our republic was founded that are so critical that they are inviolate. Principles so primary, that the elimination or subordination of them diminishes and minimizes the nation, and even our community. Individual property rights are among those. Our Declaration of Independence, which codified the Lockean Creed, declares, “We hold these Truths to be self-evident, that all Men are created equal, that they are endowed by their Creator with certain inalienable Rights, that among these are Life, Liberty and the pursuit of Happiness.” The Lockean Creed substitutes “pursuit of Happiness” with “property.” Ownership and control of private property are at the very core of these principles, without which people are not citizens, but are merely subjects of whatever government is in power over them. 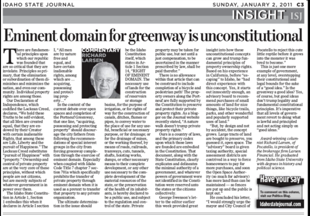 In the context of the current debate over open spaces and completion of the Portneuf Greenway, that one line, “acquiring, possessing and protecting property” should discourage the city fathers from following the recommendations of special interest groups in the city from forcing greenway completion through the exercise of eminent domain. Especially when coupled with Idaho Code Title 7 chapter 7 section 701a which specifically prohibits the transfer of private property through eminent domain when it is used as a pretext to transfer that property to any private organization. Ours is a country of laws, and the primary codex upon which those laws are founded are embodied in the Constitution. That document, along with the State Constitution, clearly explicates and delineates the minimal authority of a government, and whatever powers of government were not identified in the Constitution were reserved unto the states or the citizens collectively.